HomeComic ReviewsAdvance Review: Lizard Men #3 – On Kickstarter Now! 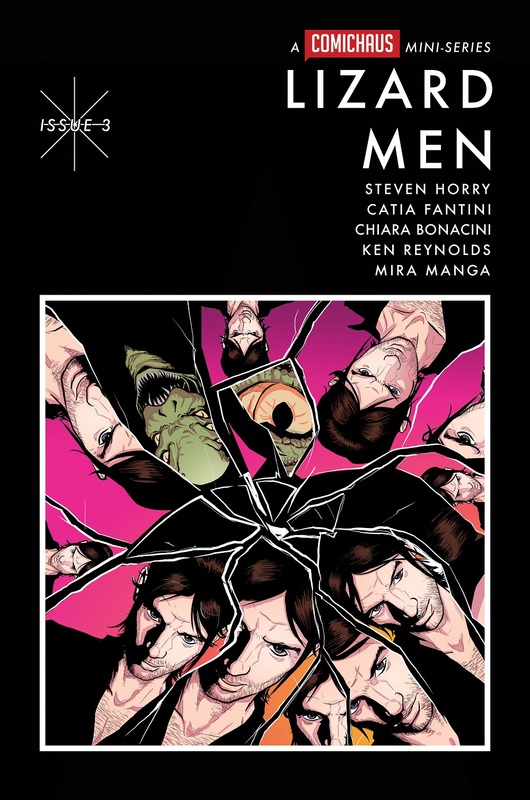 Advance Review: Lizard Men #3 – On Kickstarter Now! On Kickstarter now, the latest issue of Lizard Men. We’re at the halfway point, and I’ve been able to look inside to see what’s in store! Riding a tidal wave of optimism, your new favourite singer is Prime Minister of Great Britain. Events turn even more unlikely when he and his plans for change met the shapeshifting lizard people that realy *are* in charge of the world. After the explosive last issue, things don’t look good for the Prime Minister! Things look to be sorted out and Dylan seems to be riding some good PR, but behind the scenes things are not looking good. The mysteries are still out there, and although the men in white are pretty obvious, there seems to be some mystical support in the offing! On the subject of the men in white, they seem to have a plan to make some trouble. This trouble has yet to happen, but I’m sure that will come out. Dylan’s reaction, as well as those around him is interesting. He does seem to be getting a handle on it. Dylan is a cleverer character than people think. Although, he does get caught out in that cliffhanger at the end. the art continues to be excellent, with some nice scenes – see below, as well as some grim and gritty scenes. the colouring is excellent, there are some nice panels using colour to tell the story. The lettering also plays it part well, again – see below, this is a highly enjoyable read. This is the halfway point of the series, and I look forward to the rest! Writer/Cover Art – Steven Hory ​is a writer, artist and musician, curently writing the ongoing Comichaus anthology strip Chalk. His comics work includes art duties on Double D (Image Comics), Transrealities and The Islanders. Artist – Catia Fantini ​is the artist of the ongoing Comichaus anthology strip Chalk and has produced art for Advent Comics (USA), Red King Pres (USA), ECV Pres (USA), A. Taylor’s Galaxy Girl and in the indie italian label Damage Comix. Colourist – Chiara Bonacini ​ Working as asistant for an oficial Disney’s colorist and a Boneli’s one. She has worked for Mondadori comics and Sky and in the indie italian label Damage Comix. Letterer – Ken Reynolds ​has letered for many independent publishers and creators, including Alterna, Markosia, Grayhaven Comics & Insane Comics. He is also proud to be part of the letering team that completed the 750+ page epic that is ‘The Explorers’ Guild’ by Jon Baird, Kevin Costner and Rick Ros published by Simon & Schuster. He also writes the supernatural adventure comic ‘Cognition’ and edits the experimental comic anthology ‘Sliced Quarterly’.